Like many of the PlayStation 4 launch games, Trine 2 isn't necessarily new: it's been seen on a number of platforms already, including the PlayStation 3 and Wii U. Does the additional horsepower of the PlayStation 4 makes this version of the game, dubbed Trine 2: Complete Edition, the best you can buy on a console? Trine 2 puts you in control of three characters, a wizard, knight and a thief, as they traverse through a plethora of fantasy settings, such as a forest and dwarven caverns, fighting fantasy monsters such as goblins and skeletons. While it sounds generic, and honestly you'll see every fantasy trope represented here, Trine 2's strength lies in the gameplay, which is pure bliss. Players can switch between any one of the heroes at any time during the game, with each hero having special abilities he or she can use to navigate through a level and solve puzzles. For example, the wizard can make blocks appear out of thin air, while the knight can use his shield to block incoming projectiles. Puzzles can be solved in a number of ways using almost any hero, giving a level of freedom to the game you don't see in most puzzle games. The game isn't all about the puzzles though, as combat frequently rears its head and while simple, the combat is still a fun diversion from the platforming and puzzle solving. 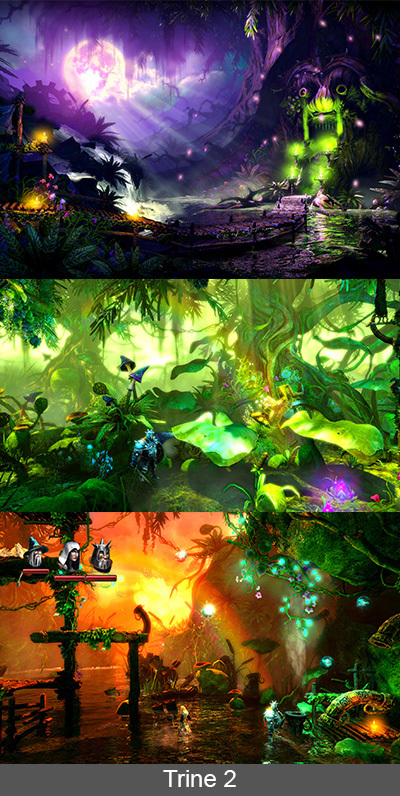 Trine 2 includes co-operative gameplay for up to three players as well, with each player taking control of one of the heroes. Co-op mode is fun and will cause you to look at puzzles in a whole new light, as you now have to navigate all three characters through each puzzle instead of just one like in single player. Golden chests abound in each level to find and collect, adding a good deal of replayability to the game as well. The adventure in Trine 2 takes about ten hours to complete, but that's not all: the PlayStation 4 version of the game also includes the Goblin Menace expansion, adding another four hours or so of gametime. For $19.99, you receive more gameplay in this downloadable game than almost any of the retail, $59.99 titles! Trine 2 will constantly challenge you to think outside of the box with each new puzzle and new ability you earn, which is truly the hallmark of an amazing game. The difficult scales nicely, and while Trine 2 never becomes controller shattering difficult, the final levels of the game are a nice challenge. Trine 2 takes advantage of the PlayStation 4's impressive specifications to deliver a game that runs at 60 frames-per-second and 1080p for the entire adventure. Trine 2 never falters at any point during the game, delivering a game that looks beautiful and runs smooth; again, something that not many PlayStation 4 games can claim. Trine 2 also takes advantage of the DualShock 4's unique features, again, not something that many PlayStation 4 games can claim. The touch pad is used in place of the analog sticks for creating blocks and other objects using the wizard, which is much more intuitive than using the analog sticks. In fact, it may even work better than using the mouse on the PC version of the game! Trine 2 was already an excellent game on past platforms, though it truly shines brightest on the PlayStation 4. The power of the PlayStation 4 helps makes this version of Trine 2 the best you can get on a console and the touch pad additions make it the best playing as well. Couple that with the downloadable content being included and you have one adventure well worth playing. While the game may not be for everyone, especially the "I love guns, big explosions, and loud noises" crowd, it's safe to say that the majority of players will love Trine 2. One can only hope Trine 3 will start to move away from its typical fantasy-based trappings and give us a new and incredible setting, in the process correcting the game's one and only flaw.